Newport's university says it will look at merging with institutions in England and elsewhere in its bid to change. It has appointed Sir Alan Wilson, a former UK government director general for higher education, to a steering group advising on available options. In December Education Minister Leighton Andrews challenged universities in Wales to "adapt or die". 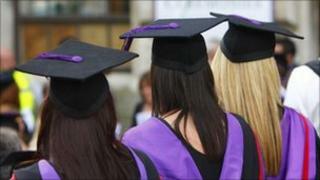 The Higher Education Funding Council for Wales (HEFCW) has said the current 11 institutions should be cut to six. Mr Andrews has said Welsh universities would only be permitted to charge increased tuition fees from September 2012, upon which their survival would depend, if they could demonstrate they intended to collaborate more closely. Since then, a number of Welsh universities have announced talks on possible moves to cooperate with other bodies. University of Wales Institute Cardiff (Uwic), Swansea Metropolitan University and Trinity Saint David in Carmarthen have said they will merge as The University of Wales. And Bangor and Aberystwyth universities have said they were committed to broadening a partnership, although they were geographically too far apart to merge. The response by the University of Wales, Newport, is to announce a "formal options appraisal exercise to consider the future structure of the university in response to the assembly government's reconfiguration agenda". In a statement, the university said Sir Alan's time with the UK government was "characterised by his expertise in widening participation". It said the steering group would look at all options, including mergers with institutions either inside or outside of Wales, partnerships with non-education based organisations and continued independence. Vice chancellor Dr Peter Noyes said: "We are not ruling any option out at this stage, but will look calmly and carefully at everything available to us." Sir Alan Wilson was vice chancellor of the University of Leeds from 1991 until 2004. In retirement, he was appointed the first director general for higher education, serving under Westminster education secretaries Charles Clarke and Alan Johnson. He is currently professor of urban and regional systems at University College London and chair of the Arts and Humanities Research Council.